LAWRENCEVILLE, Ga. - Austin Riley went 3-for-5 with a home run and five RBIs to lift the Gwinnett Stripers to an 8-3 win and three-game series sweep over the Norfolk Tides Thursday at Coolray Field. The win brought the Stripers' record to 68-67, putting them above .500 for the first time since they were 1-0 on April 6 following an Opening Night win at Norfolk. Riley began his big game with an RBI single off right-hander Jimmy Yacabonis that scored Luis Marte for a 1-0 lead in the first inning. In the third, he followed a Michael Reed double with a two-bagger of his own, making it 2-0 Stripers. Phil Gosselin and Sean Kazmar Jr. added RBI singles in the third to mount a 4-0 lead. Norfolk got two back in the fourth against righty Connor Johnstone. After Joey Rickard doubled to lead off, Garabez Rosa sent him home with a double. Drew Dosch followed two batters later with an RBI single, cutting the lead to 4-2. The Tides tacked on another in the fifth on an RBI groundout from D.J. Stewart. It remained a 4-3 game until the seventh when Riley unleashed a three-run homer (11) to left off Jhan Marinez, his sixth long ball in his last 12 games. He extended his active hitting streak to nine games, over which he's batting .361 (13-for-36) with four homers and 13 RBIs. Reed added an RBI single in the eighth for the 8-3 final. Johnstone (W, 2-0) went 6.0 innings, allowing three runs on five hits with a walk and three strikeouts. Miguel Socolovich (H, 5), Shane Carle and Jacob Webb each worked a scoreless inning in relief. Yacabonis (L, 2-2) lasted only 2.2 innings, surrendering six hits, four runs and two walks with five strikeouts. Lucas Long worked 3.1 perfect innings in relief before Marinez was tagged for three runs on three walks and a hit in 0.1 inning. 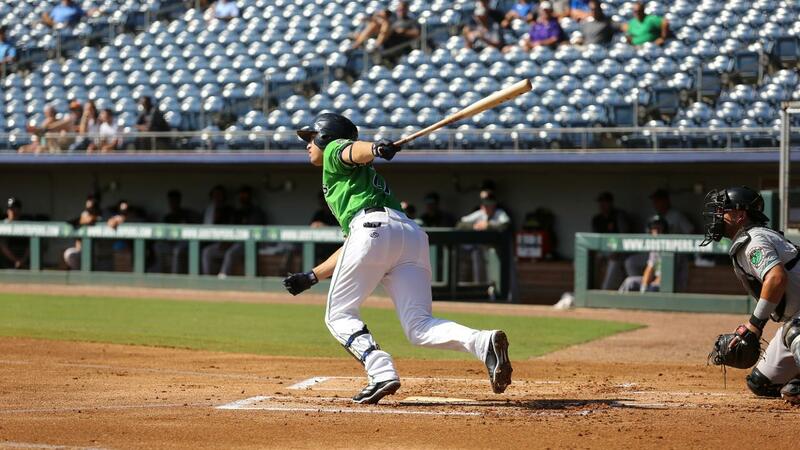 Reed went 2-for-4 with a walk, an RBI and two runs scored for the Stripers. Xavier Avery walked three times and scored a run. For Norfolk (68-67), Drew Dosch and Mike Yastrzemski were both 2-for-4. The win pulled the Stripers within 3.0 games of the International League Wild Card lead with every other league game still to be played Thursday night. The Stripers (68-67) begin the final series of the regular season against Charlotte Friday at 7:05 p.m. Lefty Max Fried (2-6, 4.70 ERA) is scheduled to start the first of four games for Gwinnett against fellow southpaw Jordan Guerrero (6-2, 3.36). Dave Lezotte will have the play-by-play call on 97.7 and 93.5 FM "The Other Side of the River" beginning at 6:35 p.m.